This blog post was written by Paola Palacios, Programme Coordinator of the Initiative for the Institutional Strengthening of Social Programmes (IPRO) and Monserrat Hernández, Project Consultant for IPRO at Transparencia Mexicana, the National Chapter of Transparency International in Mexico. Mexico is the second biggest economy in Latin America and growing steadily. Yet, despite its economic performance Mexico suffers from extended poverty and inequality. As one of its priorities, the newly elected government launched a ‘Crusade against hunger’. It will focus on 400 municipalities with high levels of extreme poverty and food shortages. These municipalities are the home to 7.4 million of the 52 million Mexicans that live in poverty. 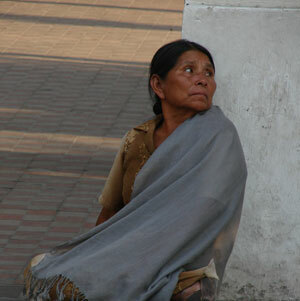 For the past 30 years, Mexico has been a global leader in the use of social programmes as a means of reducing poverty. Social programmes have been the axis of the country’s national anti-poverty strategy. Now, a new strategy aims to combine efforts between the federal, state-level and municipal governments, civil society and international organisations, requiring the coordination of at least 70 social programmes. Since there is a strong and positive correlation between transparency, accountability and development outcomes, it is crucial to make social programmes — especially those in a politically sensitive Crusade— subject to independent external scrutiny. An obvious but rather difficult question to answer is how institutionalised are social programmes in Mexico? And particularly, how those oriented toward alleviating hunger perform. In most countries, including Mexico, where federal states have different social programmes, it is difficult to know how many of them are running and what their levels of impact and effectiveness are. A recent panel organised by the Open Government Partnership in Chile, showed that not only federal governments like the Mexican, but also centralised governments like the Chilean, present common problems in the integration of each one of the programmes in a single database, including results and impact. Even in developed economies, the task of creating public, open databases with this information has proven difficult. In the case of Mexico, a couple of recent efforts have tried to solve this conundrum. The government, international organisations and civil society have joined efforts to consolidate a single database that provides information about the levels of institutionalisation of social programmes, both at the federal and at the state-level governments. The results are quite shocking. In a country with one of the most advanced access-to-information laws, only 50 per cent of the programmes oriented toward alleviating hunger make their budget and expenditures report public. Furthermore, 63 per cent of the programmes with the objective of curbing hunger do not have any kind of independent evaluation. With so little public information about these programmes and so little independent evaluation, it is difficult to see how they create a good and integrated response to poverty and hunger. The results were obtained from the analysis of social programmes that were registered in the information system IPRO by federal and states governments in 2012. Mexico has more than 2,000 social programmes operating in the country. Financing development is not the only obstacle anymore. The main challenge is making sure each one of the “pesos” spent in those programmes is wisely spent. The institutionalisation of social programmes — by making them transparent, accountable and with civic engagement — is the only way taxpayer pesos will be transformed into concrete results to defeat poverty and hunger. In line with these efforts, Transparency International is also promoting a regional programme, named EELA (Economic Equality in Latin America), to foster the mechanisms through which the beneficiaries of social programmes can play an active role in monitoring and tackling corruption and misuse of public resources.